After an intro by Prumsodun Ouk, Trent Walker walked us through a smot performance this evening, at the performance/rehearsal space of Khmer Arts Academy, just off of Anaheim Street (Long Beach California). Smot is a little scary to some people: it’s generally seen as funeral music, but it’s also considered theraputic for people in need of physical and spiritual healing. 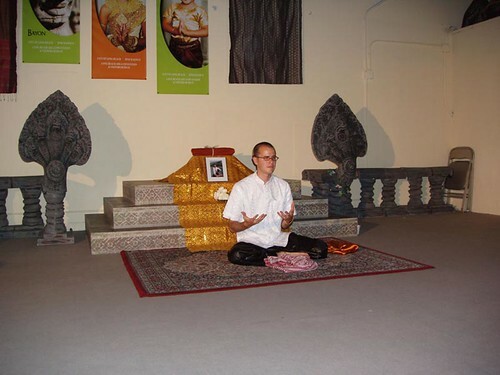 The words are taken directly from Buddhist scripture, and sung in Khmer. Some of the attendees were quite moved – you just don’t get a lot of live Smot in the States. I was really happy to see Khmer Arts Academy put this presentation together. Trent took this one step further and sang an English song about his teacher (Prum Ut of Cambodian Living Arts), who is having some health problems. This was moving and intriguing – it shows Smot is a vernacular form and capable of ‘daily life’ relevance. I’ve urged Trent to record an MP3 of the song, if he webs it up I’ll pass on the link. Khmer Hip Hop mogul Prach Ly made a guest appearance, appreciating the music for a spell, then ducking out to prepare for a mic check – not before leaving me a copy of his latest CD. A great day for music. Trent and a few of the local art contingent headed out to Denise Scott’s place for food and catching up.